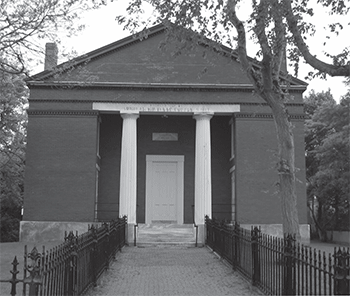 The imposing Greek Revival structure on Winter Street known as the Coffin School has played an important educational role in the lives of Nantucketers since its completion in 1854. 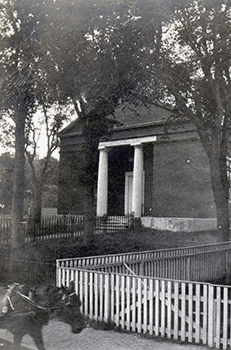 The school, however, can trace its origins to 1827, when Admiral Sir Isaac Coffin,a veteran of the Royal Navy with ties to Nantucket’s Coffin descendants,provided funds for the establishment of the school. Known as the Admiral Sir Isaac Coffin Lancasterian School, this educational institution was founded by Coffin for the purpose of “promoting decency, good order and morality, and for giving a good English education to youth” who were descendants of the late Tristram Coffin, one of the original proprietors and to whom a great many Nantucketers were related. The school first opened in a pre-existing building at Fair and Lyons streets with 130 children aged seven to sixteen; girls and boys were taught separately in the Lancasterian style—a discipline where older students served as tutors and monitors and taught the younger classes. In 1846, the Fair Street School was closed, most likely due to the island’s declining population and economy. At that time, the Coffin School Trustees decided to allow the endowment to grow with the hope of opening a new facility on land they had acquired on Winter Street. By 1852, funds had increased significantly and construction began. The architect of the present structure is unknown, but early records show that the builders were James Thompson and Edward Easton. In 1854, the brick school opened its doors to the first students, now with an expanded faculty (the Lancasterian method had been abandoned in 1831) and classes that ran six days a week. 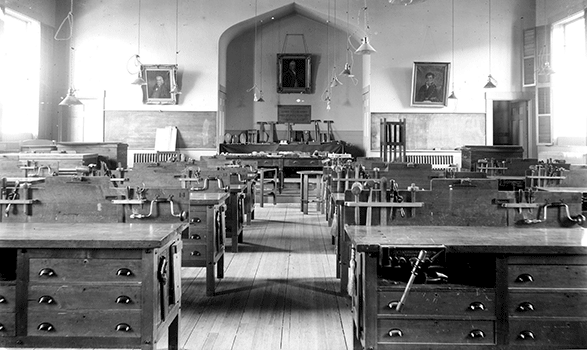 During its early years, however, the Coffin School struggled to maintain a steady number of scholars, largely due to competition from mandated public schools. An upsurge in enrollment occurred in the 1870s as the island economy improved, which allowed for construction of a rear addition, but in 1898 the school again fell on hard times and was forced to close. Rebirth came in 1903, when the Coffin School Trustees, working with the public schools, offered ninth- through twelfth-grade students subjects such as woodworking and mechanical drawing for boys and home economics for girls. With the introduction of electricity, evening classes in specialized skills such as basketry and sewing were offered for adults. In 1918, another addition at the rear of the school was built to serve the home economics courses. By 1941, the school was fully integrated with Nantucket’s public school system and classes continued until 1968. The following year, the school became the site of public kindergarten classes that continued until 1978. Throughout the late twentieth century, the building also served island nonprofits for purposes such as lectures, classes, and musical events. In 1996, the Coffin School Trustees provided a long-term lease for the building’s interior to the Egan Maritime Institute, providing a home for the new organization. Today, Egan Maritime Institute shares use of the building with Nantucket Community Sailing, and the main hall continues to be used for lectures and concerts by other island groups. The Coffin School Trustees, some of whom are descended from the original trustees, or who went to school at the Coffin School, or who had family members who were teachers at the school, continue to own the Coffin School and continue their work of education – providing grants and scholarships to island youth and island youth-oriented programs. Written by Jascin Leonardo Finger, a Coffin School Trustee, and curator of the Mitchell House, Archives, and Special Collections at the Nantucket Maria Mitchell Association.